Cotton, polypropylene, and nylon webbing are used in many wide ranging applications. They’re used for accessories like belts and bag straps, for pet collars and leashes, for sporting goods and outdoor gear, and in transportation for tie downs and cargo straps. It’s commonly 1” or 1 ¼” in widths and comes in various colors. Cotton webbing is soft to the touch, making it great for apparel and accessories. 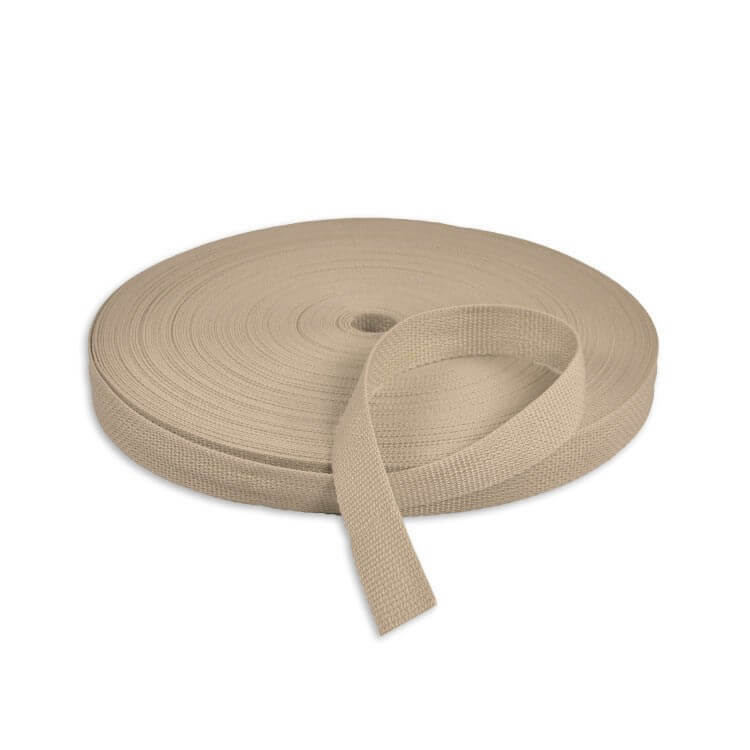 Our selection of cotton webbing includes a range of colors in 1 or 1 and 1/4 inch widths. Nylon webbing is the strongest material and is highly abrasion resistant. This is a popular choice to use for rock climbing harnesses and camping gear. Polypropylene webbing is a little over 1 mm thick and is the best for outdoor uses because it repels water and is mold and mildew resistant. This webbing is not as strong as nylon webbing, so it’s not appropriate for load bearing applications, but would work well for bags and belts. Jute webbing is used in upholstery to support cushions on chairs and couches. It is also used for decorative purposes in crafts. It’s made out of closely woven jute that is lightweight and durable. Jute webbing is attached using either upholstery staples or tacks. A webbing stretcher may be useful depending on how tight you need it to be on the frame. Rubber webbing is also used in upholstery, but is elastic so it provides support with comfort and bounce. First manufactured in the 1950’s, it’s often found in mid century modern furniture. It can be used to replace original webbing or as an alternative to springs. See our article on How to Finish Webbing to find out how to best seal or sew the edges of webbing. Click here to see our wonderful webbing selection!